The world's most famous desert isn't always quite so dry as it is now—thanks to the Earth shifting on its axis, the Sahara's climate gets gradually greener over tens of thousands of years. But you'd have to go back a long ways to find real, perennial rivers flowing through the Sahara outside of the Nile. But 100,000 years ago, the Sahara was awash with rivers that might well have led humanity's ancestors to the Mediterranean. That's a possibility raised by new work from an international team of researchers, whose computer simulations suggest the presence of massive river systems in the Sahara between 130,000 and 100,000 years ago. Much like the Nile, these rivers would have created narrow stretches of nutrient-rich soil, producing "green corridors" that would have allowed animals and plants to prosper in the otherwise inhospitable desert. What's more, the simulations suggest the likely presence of "massive lagoons and wetlands" in what is now northeastern Libya, covering an estimated 27,000 square miles. The full methodology behind the simulations is detailed at the link below, but the basic idea is that they shift the average location of the African monsoon about 450 miles further north, which brings greatly increased rainfall to the Sahara. The researchers have been able to compare and match the simulation's predictions of more recent times with actual historical data, suggesting that the model does have predictive value going further back. 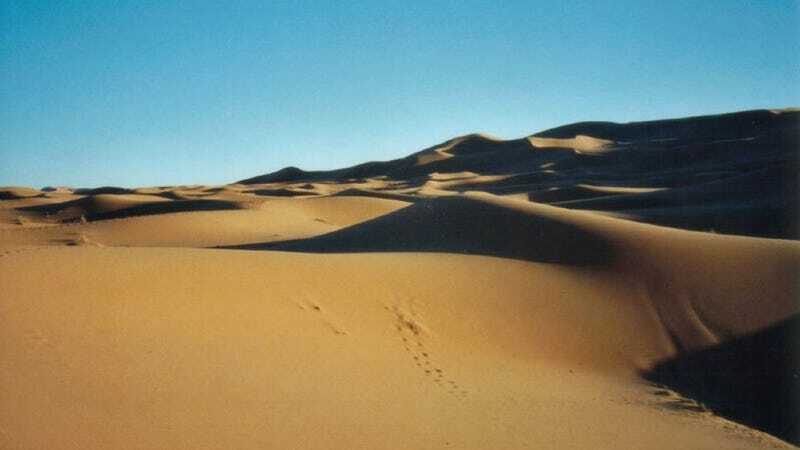 The river beds should still be somewhere in the desert, but they are now buried under the Sahara's massive sand dunes. Besides, the presence of these ancient rivers is well-supported by the reality of ancient human migration out of Africa, which would have required our forebears to cross the treacherous Sahara. These rivers would have provided a lifeline that would have allowed humans to make the journey. Indeed, the westernmost of these predicted rivers, the Irharhar, would have been a particularly appealing natural path to the Mediterranean, as it flowed south to north from the monsoon-washed mountainous regions to the more temperate north African coast. You can check out the original paper in its entirety at PLOS ONE. Image by mtsrs on Flickr.